O Christmas tree… | "Big Old Daddy"
The last time we brought a fresh Christmas tree into the house, both kids started sneezing their heads off, and stopped as soon as we removed the tree. Since then we’ve had a fake, sneeze-free tree. This year Susan noticed a Douglas fir in the backyard that was already about ten feet tall. Left on its own, it would become a beautiful, spreading tree completely overwhelming the yard and blocking neighbors’ views. One neighbor planted their Christmas tree years ago; it’s now more than 50 feet tall. We decided to harvest the tree in back and give the fake one a year off. But when I put it up in the living room, it revealed big bare patches, a heavy circle of spiky branches around the top, and a general lack of the symmetry we usually associate with Christmas trees. It was not beautiful. We appreciate how Lauren’s taken ownership of getting lights and ornaments on the tree and putting up many of the household decorations in recent years. When she saw this year’s tree, however, she announced that she wouldn’t decorate such an ugly one. When Lauren lobbied for getting out the fake tree, I was ready to deliver a mini-lecture and then argue with her. Thankfully, Susan stepped in to save the day: she suggested that each of us put three ornaments on the tree before watching a movie. How sensible. How thoughtful. How manageable. We did it, and not too long afterward the decorated tree didn’t look quite so bad. It’s the freshest tree we’ve ever had. It’s green – he dragged it all the way home without using a car. It’s a Charlie Brown tree. That’s this year’s story, and we’re stickin’ with it. 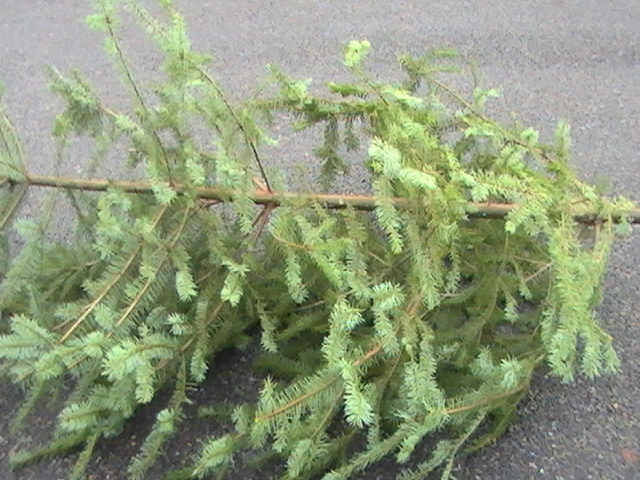 And even though we’ve often left our tree up until the twelfth day of Christmas (Jan 6), it’s already down. The kids were sniffling and sneezing (though not as much as before), and none of us were too sorry to get it out the door. Around Christmas we can load ourselves up with expectations for welcoming our perfect families and friends into our perfectly-decorated homes to serve them perfect meals and exchange perfect gifts. But once upon a time, people expected the arrival of a Messiah who would be a conquering hero and a political leader. The Messiah came instead as a baby, the weakest and most dependent of creatures, and there wasn’t even a clean or comfortable place where this little one could be born. I’m beginning to understand that when my expectations are turned inside out or upside down, it may announce the arrival of something bigger and more wonderful than I could begin to imagine. This entry was posted in family and tagged Charlie Brown, christmas, Christmas tree, expectations, fake tree, Messiah. Bookmark the permalink.